I have little to no complaints about the actual poster of the films. One of the last drawn posters (the last are for The Living Daylights) of the franchise, and they are really exciting, with Bond standing fiercely on the Golden Gate Bridge or on the Eiffel Tower. So, I had to try something radically different for this one. 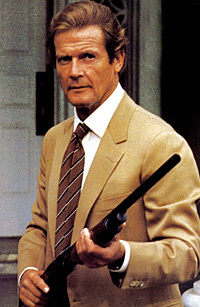 I had in mind a picture of Moore, holding the shotgun (or, whatever that thing is called) in front of Stacey’s house. This picture was never used in any of the existing posters, so… why not give it a chance? First problem. The picture quality. You can see here the real picture used for the final poster, in its real size and resolution. I thought that this picture, quite iconic I must say, would exist i higher quality, but… no. After more than 20 minutes browsing the Web, nothing. Well, I’ll make it do! Then, the idea: Well. You can’t be avoiding the two main monuments of the movie: the Golden Gate Bridge of San Francisco and the Eiffel Tower (or, should I say, la tour Eiffel!). I chose the Golden Gate brigde for the view, more suitable for that poster. But I had to work a lot on it. Impossible to use it « like this », freshly taken from Google. I thought a red tone would be great, with a slight « painted » effect. You may notice the « Zorin » logo in the sky, very Batman-ish. Well, at first, I was actually thinking of making it like the real Batman logo (with the fog and everything), but that would have been too much, right? Then, I’ve added sir Moore, all blurry and pixelated. There’s some work to do here. So. How to improve the quality? Well, first, the famous « painted » effect, used with the finger tool on Photoshop. 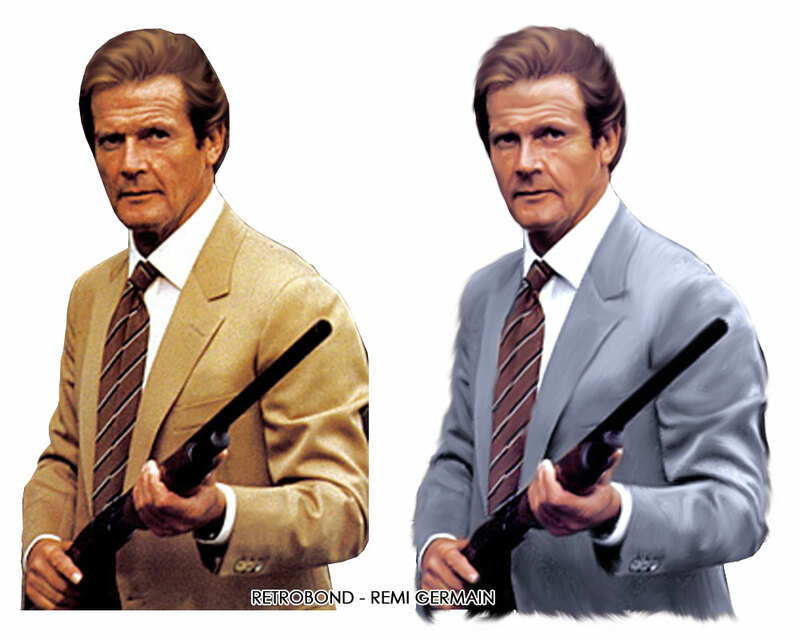 And, then, some light and contrast correction, and finally, the… color of the jacket. It’s just… that… the yellow jacket doesn’t fit here. The final touch! 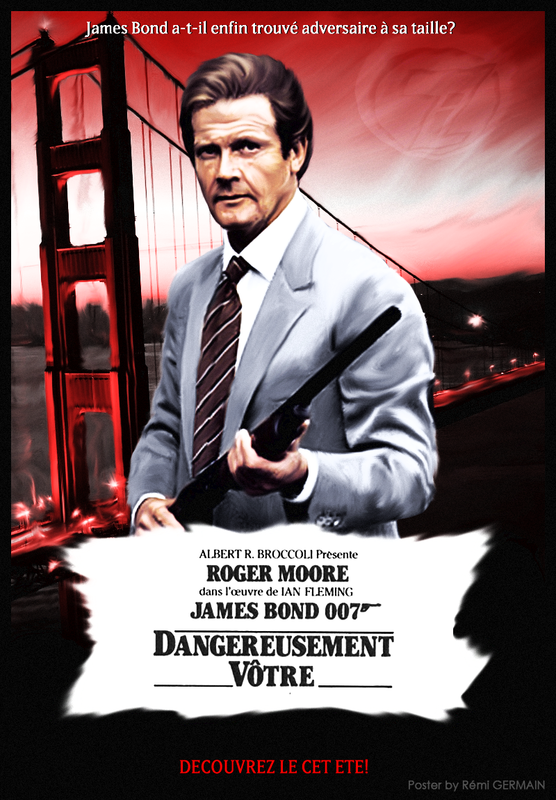 The cacthphrase « Has James Bond finally met his match?« , and the answer « Find out in summer! » is added, plus the title (Directly taken from an existing poster, as I don’t have the same font.). I decided to « destroy » a little bit the white box, to give a more dynamic side to the poster. So here it is! With also the French version. 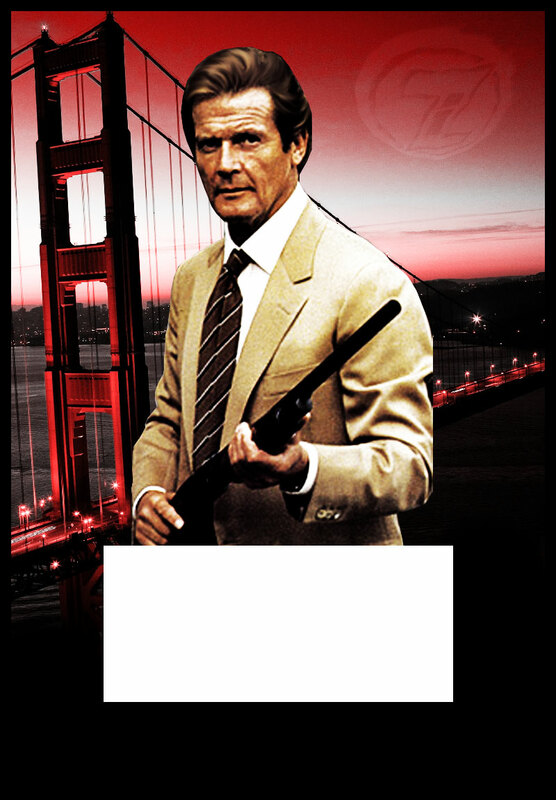 Trivia: The french title « Dangereusement Vôtre » is a reference to the TV Series « The Persuaders« , wich was very famous in France. The french translation was « Amicalement Vôtre » (Friendly Yours). ← [Licence Revoked] – Early Teaser.